I bought these bath bombs/fizzes for my boyfriends mum last year and they smell amazing! You get 4 lightly fragranced, egg shaped bath fizzes that come wrapped in beautifully patterned paper, in quirky egg container. For under £10, it’s the perfect gift for any bath lover and if you are looking to get even more bang out of your buck, you could always split these between friends and make little gift bags! 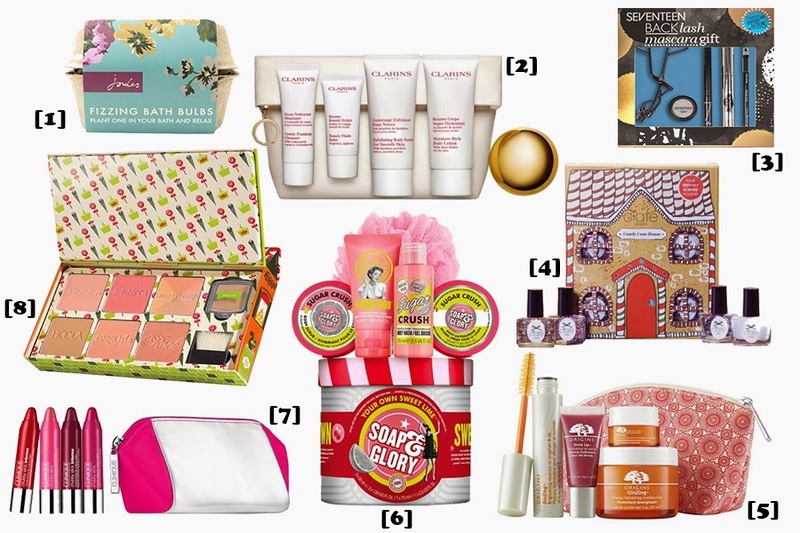 Christmas is the perfect time of year to pick up a gift set from high end beauty brands. It gives you a chance to try out multiple products for the price of just one! This Clarins ‘Skin Care Hereos’ kit is worth over £54, but costs just £25! The kit includes their Gentle Foaming Cleanser 50ml, Beauty Flash Balm 30ml (a favourite of mine), Exfoliating Body Scrub 100ml and their Moisture-Rich Body Lotion 100ml, all of which comes presented in a pretty wash bag. When it comes to lashes, boots SEVENTEEN have it in the bag. I love their mascaras, one of my all time favourite mascaras is their Doll’d Up Mascara and this kit has everything you need to create fuller and longer looking lashes. The kit includes SEVENTEEN Blacklash Mascara, Eye Kohl Pencil, Eyelash Lacquer, Limited Edition Solo Eye Shadow and SEVENTEEN Eyelash Curlers. To unwrap something Christmas themed is always nice on Christmas day and this set from Ciate doesn’t disappoint. The set that comes in a cute candy cane house and includes 4 scented polishes from cinnamon to candy cane, perfect for the christmas season, or for any nail polish lover! I received an Origins Mask Marvels gift set last Christmas and it has been one of my most used beauty gifts this year! So when I saw this set, that includes the GinZing moisturizer 30ml and for £30.00 I knew it had to be in my top picks. This set also includes GinZing Brightening Mascara 14ml, Refreshing Eye Cream 5ml and Hydrating Lip Balm 7ml. Forget the original Soap & Glory scent! The Sugar Crush range smells divine and if you haven’t yet tried it, or know someone who’s a fan of Soap & Glory this set is a winner! The gift set includes; Sugar Crush Body Wash 75ml, Body Scrub 50ml, Body Buttercream 50ml, Hand Cream 50ml and a suds-boosting Body Polisher! Behold a cute pink and silver cosmetics bag containing four miniature (1.2g) award winning Chubby Sticks from Clinique! The set includes; Woppin’ Watermelon, Plushest Punch, Pudgy Peony and Grandest Grape. And last but by no means least, my favourite of all the gift sets on offer this year, Benefits Cheeky Sweet Box O’ Blushes Set. I’m not usually a fan of makeup products housed in large cardboard boxes like this one, but I can make an exception! In my opinion Benefits powder products are the best products they offer. In this set you get Dandelion Blusher, Sugarbomb Blusher, CORALista Blusher, Bella Bamba Blusher, Hoola Bronzer, Rockateur Blusher and Watt’s Up! Highlighter! You even get a little brush. What’s not to love? !